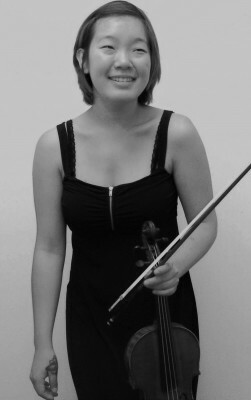 Angela is a British violinist of Korean origin who is much in demand as an orchestral musician. She performed in number of prestigious venues across Europe. To name a few, engagements include Royal Albert Hall, Royal Festival Hall, Queen Elizabeth Hall, Wigmore Hall, Cadogan Hall, St John's Smith Square, St Martin in-the-Fields, Royal Overseas League in UK, Union Hall in Slovenia, Casa da Musica and Centro Cultural Vila Flor in Portugal. Angela works regularly with orchestras such as Bournemouth Symphony Orchestra, London Symphony Orchestra (side-by-side), Northern Lights Symphony Orchestra, Philharmonic Chamber Orchestra of London, Sinfonia Cymru and Kent Sinfonia. In 2011, despite being one of the youngest member, she was invited to be a co-leader of Fundaçao Orquestra Estúdio, in Portugal. In 2012 she had the honour to perform Penderecki's symphony under the baton of Maestro Penderecki himself in Germany. 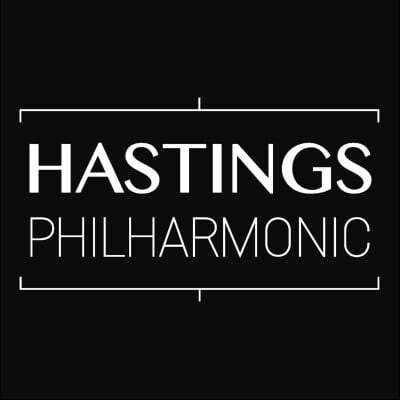 Despite continuing working as a freelance violinist with number of orchestras, since 2015/2016, she was appointed as a leader of the Hastings Philharmonic Orchestra. Angela completed her Masters of Music with Merit in Orchestral Artistry - a specialism in association with the London Symphony Orchestra at the Guildhall School of Music and Drama (GSMD) which was generously funded by the Leverhulme Arts Scholarship. During her time at GSMD she was under the tutelage of Krzysztof Smietana and Boris Kucharsky. She completed her Bachelor of Music with Honours in Violin Performance, gaining a distinction on her final graduation recital whilst studying with Mayumi Fujikawa. As an active chamber musician she performs regularly with her string quartet in masterclasses; including those with the Chillingirian Quartet, Wihan Quartet, Endelion Quartet, Kopelmann Quartet and the Danish Quartet, to name a few. In the past, she was 1st violinist of the Armonia Quartet, where they participated in Lake District Summer Music International Festival, as well as being appointed as the string-quartet-in-residence for the South West Youth orchestra. Since returning to the UK, she has been the 1st violinist of the Haru Quartet, where they won the John Barbirolli Competition in 2014 and becoming a finalist in Cavatina Chamber Music Competition in 2011 and 2014 exclusively. She also took part in the Latin American Music Festival 2013, performing with the Festival String Quartet. Angela takes great interest in being involved with different types of education programme. Currently she takes part as a violin tutor in side-by-side programme with different youth orchestras across UK. In the past, she was involved with 'FunHarmonics' activity provided by the London Philharmonic Orchestra – a programme to have a go at playing an orchestral instruments, and 'Raising the Roof' – an outreach programme for schools provided by Trinity Laban Conservatoire of Music and Dance. Angela currently teaches both violin and piano at St Nicholas Preparatory School and at Norland Place School in London. 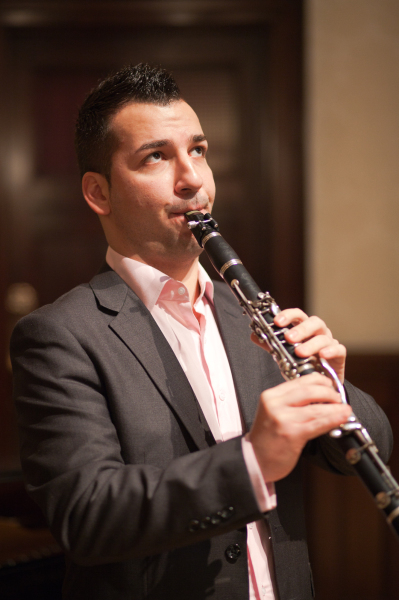 Boyan Ivanov was born in Yambol, Bulgaria, and is one of the most promising Bulgarian clarinettists today. He has already performed as a soloist, chamber and orchestral musician at many prestigious venues including the Barbican Hall, the Royal Festival Hall, the Royal Albert Hall, Queen Elizabeth Hall, St Martin in the Fields, Cadogan Hall, Kings Place, St John’s Smith Square, and St James’s Piccadilly among others. Boyan graduated from the Plovdiv Academy of Music, Dance and Fine Arts with the highest honours. His professor and mentor there was the renowned Prof. Petko Radev, a long-time principal clarinetist of Milan‘s La Scala. During his studies he toured extensively throughout Europe and South Korea with several Bulgarian orchestras, and won numerous prizes and awards, including third prize in the 2003 International Competition for French Music Performance. He also participated in Masterclasses with eminent clarinetists such as Michael Collins (UK), Andrew Marriner (UK), Robert Spring (USA), Charles Neidich (USA), Reiner Wehle (Germany), Nicolas Balderou (France), and Hervé Cligniez (France). In 2008/09 he moved to London to undertake further study with the Spanish virtuoso Joan Enric Lluna at Trinity College of Music, where he gained the FTCL Recital Diploma in Clarinet. He performed as Principal Clarinet of the Trinity Symphony and Chamber Orchestras, and was selected to play the clarinet solo part in Bernstein’s famous Prelude, Fugue and Riffs with Trinity Jazz Ensemble at Blackheath Halls. After graduating he moved to Guildhall to study on the Masters course with Julian Farrell and Nicholas Carpenter, graduating in 2010. During this time he performed as Principal Clarinet with the Guildhall Symphony Orchestra and was awarded the Making Music Philip & Dorothy Green Award for Young Concert Artists. As part of this, in 2011, he gave numerous recitals for Music Societies across the UK and was invited to perform as a soloist with the Dulwich Symphony and Warwickshire Symphony Orchestras. A founding member of the Inspirity Ensemble, Islington Camerata and the Trinity Trio, he remains an active solo and chamber player, and since 2012 has been a regular Classical Guest Entertainer aboard Cunard, P&O, Fred Olsen and Saga cruise ships. In 2012 Boyan made his performing debut at Kings Place where he gave the UK premiere of the American composer Deborah Netanel’s piece 'Before'. In November 2012 he participated in a concert with the world renowned Chilingirian Quartet at the same venue, and he also performed at the Wigmore Hall as part of the Chamber Tots Programme. In 2013 Boyan gave a performance of Weber’s Clarinet Concerto No. 2 with King’s College London Chamber Orchestra, for which he is also the Orchestral manager. The Argentinean composer and conductor Fabricio Brachetta also invited him to perform the premiere of his new Clarinet Concerto alongside the Mozart Clarinet Concerto with London Arte Chamber Orchestra in aid of the Stroke Association. In 2014, as a member of Orion Symphony Orchestra, Boyan participated in the 'Celebrating Jon Lord' Concert at the Royal Albert Hall, together with the rock legends Deep Purple, and a few months later took part in the 'Journey to the Centre of the Earth' UK Tour with Rick Wakeman. In 2015 he appeared as a soloist with the Aldwych Sinfonia, playing Copland’s Clarinet Concerto unconducted, and was recently soloist of the brand new London based Vox Vanguard Symphony Orchestra, playing Mozart’s masterpiece Clarinet Concerto in A major. As an orchestral musician Boyan plays regularly with a variety of orchestras, including Hastings Philharmonic (for which he is also Orchestra Manager), Orion Orchestra, Firebird Orchestra, Orpheus Sinfonia, London Arts Orchestra, King’s Chamber Orchestra, Aldwych Sinfonia, and Guernsey Sinfonietta among others, and he is part of the Ensemble OrQuesta, Co-Opera Company and OperaUpClose Orchestras.